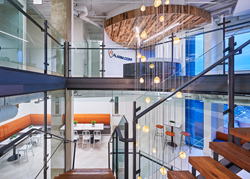 OTJ Architects has completed an ambitious design and build-out of the headquarters of multinational security technology firm Alarm.com, the leading platform for the intelligently connected property. Located at 8281 Greensboro Drive in Tysons, VA, the approximately 120,000-square-foot space spans six 20,000-square-foot floors, comprising a ground-level reception and training center, a central fifth floor, and consecutive eighth through eleventh floors. With a mission to energize the organization and inspire continued innovation, the floors include collaborative and private spaces, state-of-the-art engineering and testing facilities, as well as showcase areas designed to support wellness and community-building activities. A comprehensive program was developed to identify and deliver a multi-level workplace that met criteria envisioned by the client. The OTJ team, headed by Ania Leeson, AIA, LEED, AP, Partner and Studio Director, began the process with a series of design charrettes. Several floor plan designs were then submitted that captured the desired balance of department layouts, adjacencies, density, growth and collaborative space. OTJ also provided the Alarm.com leadership, design committee, and individual department representatives with high-quality, three-dimensional renderings and physical mock-ups that facilitated the decision-making process. A reclaimed barn timber stair with black metal stringers connects floors eight through eleven, and serves as a core design element. With an aim to promote staff connectivity, as well as offer convenient movement between floors, it includes such invigorating details as a pond at the foot of the stairs, brick pavers, and natural moss-covered light fixtures. The ground level space opens to general reception and expands into Alarm.com’s training center. Designed with flexible space, it supports Alarm.com’s experiential and hands-on training program for its thousands of service provider partners and for internal development and training programs for employees. The fifth floor includes a special team-building destination in which staff members from all departments interact in a relaxed environment that features a large library-inspired lounge to foster team-building and collaboration. A hidden door in the wall reveals a pub-style ping pong room where employees gather throughout the day. In addition, the floor has a reclaimed shuffle board from a local bar, along with a wide variety of comfortable seating areas. Several areas on the eighth floor were specifically allocated for well-being spaces, such as a “creative lounge” and a garden featuring a natural slate communal table filled with succulents. Adjacent to the garden is the signature Oxygen Room, complete with wellness-enhancing elements such as purified air, a green wall with a trickling natural white noise irrigation system, and a glowing ceiling featuring light patterns that mirror the human body’s circadian rhythms. Smartphones, iPads and other technology devices are discouraged in the Oxygen Room. The ninth floor includes a technology development center and features the Alarm.com rendition of a Genius Bar manned by in-house technicians. The tenth floor contains staff offices, plus a pantry, kitchen and seating area. On the eleventh floor is a reception for visitors, company boardroom, conference areas and executive suites. Among the many intuitive design details are light-filled interior offices and a way-finding system that identifies the various functions of the individual floors by integrating brand-focused colors. OTJ Architects is a premier interior architecture and design firm that creates award-winning projects nationwide from its offices in Washington, D.C. and New York, N.Y. For nearly 30 years, OTJ has partnered with leaders in the commercial real estate, corporate, government, and non-profit sectors to help organizations meet their human, operational, and business objectives through the power of the built environment. Signature recent projects include workplaces for Adobe, BMW, and United Way as well as Innovation Centers for Booz Allen and Capital One. More information is available at http://www.otj.com.